In yesterday’s post about chocolate chip cookies, I mentioned that I could bake only six cookies at a time as it spread a lot. So after a couple of batches, I decided to improve things a bit. A little bit of searching landed me with a few treasures – two small packets of gems chocolate (Indian version of M&M), half empty bottle of peanut butter and some oats. I mixed all this into the choco chip cookie batter (it was more batter like than a dough) till I got a reasonably stiff batter, again not a dough, but not a soft dough anymore. And baked them in tablespoonfuls again. The results were outstanding. 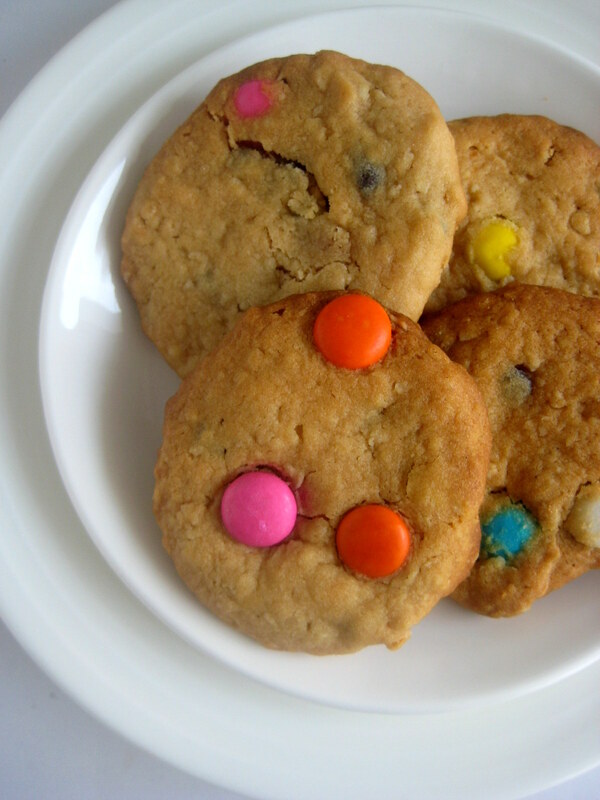 I loved these polka dot cookies the best! It had peanut butter, choco chips and gems in it. Baking with peanut butter is something beyond description! The gems disappeared in the batter for the first batch. 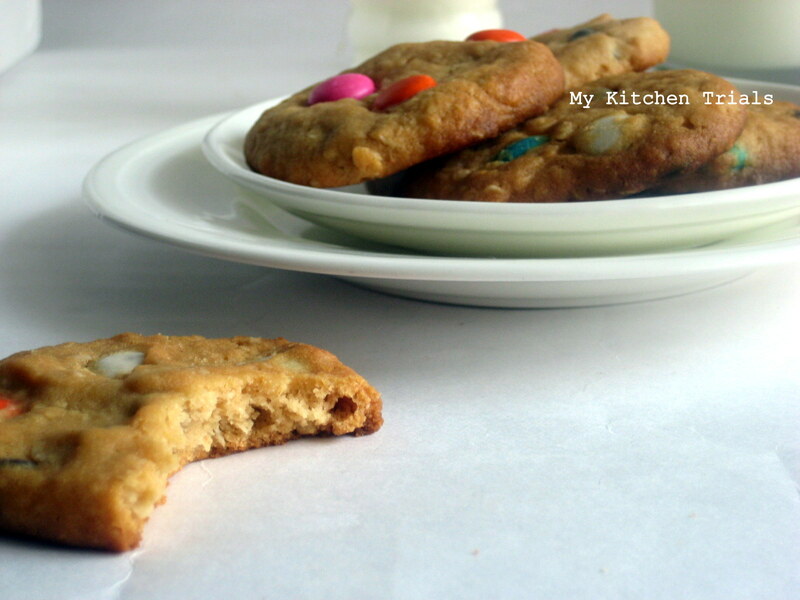 From the second batch onwards, I picked them out of the batter and pressed on top of the cookie. For improved looks, you know :D.
This recipe is off to Blogging Marathon 27. Check out the Blogging Marathonpage for more details. Make the chocolate chip cookie dough as per the recipe. It will be a soft, but thick, cake like batter. Add the peanut butter and oats to the prepared dough. Note that you can add a bit more or cut a little less of the oats to the dough to get a stiffer consistency. Drop by heaped tablespoons in a baking tray lined with butter paper. Bake in a preheated oven for 8-10 minutes, until the edges turn brown a bit. These surely looks excellent Rajani..My kids would not probably wait for me to use them on the dough!..Btw forgot to check, did you use icing sugar or powdered sugar in the batter..icing sugar prevents from spreading..will check the recipe now..
Gems,i cant resist to them, i would not keep myself away from them..Cookies are seriously terrific. I munch on them before putting them in anything :( The cookies are so lovely to look at. These look awesome! 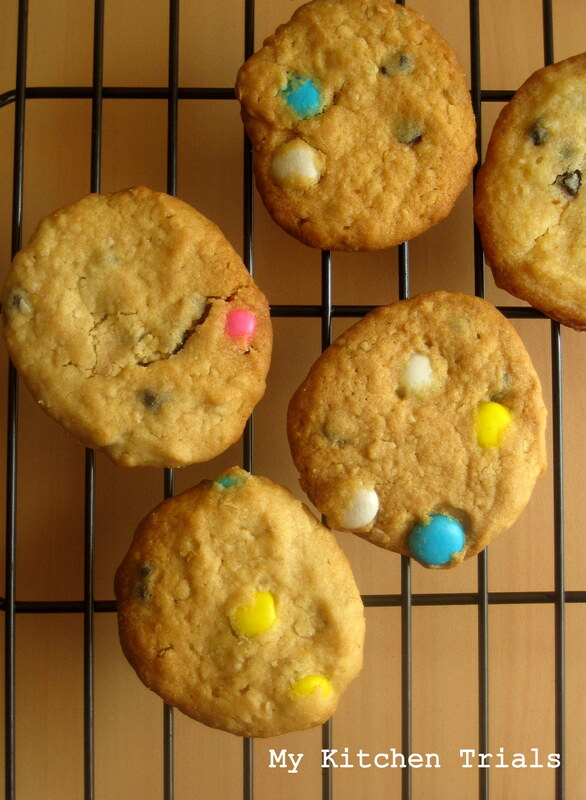 My kids love the mini m n m’s in cookies! Those cookies look colorful and delicious. They look colorful. These m n m kind cookies are my daughter’s favorite too. they look so pretty, the colorful gems look beautiful, a real treat for kids. Healthy one and love the gems addition. Gems tastes better than M&M for me.